Putney & Wimbledon Brass Band are delighted to announce our Christmas schedule – please see the table below for all our public engagements. It’s a packed month but we’re looking forward to it, we love bringing the Christmas cheer to the local community! We’ll update this page should there be any changes, but keep an eye on our social media (see links at the bottom of the page) for all the details! Every year – in a tradition that dates back over the past hundred – brass bands from around the country (and beyond!) gather on the first Friday after the Whitsun to entertain the crowds in the villages of the Saddleworth district, just outside Oldham. Often referred to as “The Greatest Free Show On Earth,” the bands make a whistle-stop tour around the twelve participating villages in the area. At each stop, they play “on the march” through the crowd-lined streets of the village, before performing a traditional march (this time, standing still!) to be assessed by a ‘blind’ judge hidden in a caravan or similar. 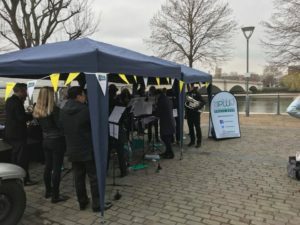 Brass bands of all standards take part and – with prizes on offer for the best performances – each band attempts to visit as many of the villages as possible. Eight is a challenging target, but – with the distraction of beer tents, local food stalls, and the chance to see some of the nation’s most famous brass bands perform for free – most will be happy to make it round the requisite six. In an area famous for its brass banding heritage, the day brings quite the audience and atmosphere, with the real fun coming from innovative brass arrangements of well known tunes, inventive costumes, and the general chaos of getting 50+ bands through a village in the space of a just few hours. With fairy-lights – hung from the trees on the village greens – providing the illumination as the sun sets, it’s the perfect setting to meet and mingle with the members of other bands, whilst bonding with those of your own. On a chilly Wednesday evening in early February, a quiet corner of Wimbledon was warmed by the rousing tones of Putney & Wimbledon Brass Band. In Dundonald Congregational Church they performed in front of a packed crowd in support of the Wimbledon & District Guide Dogs, with several of the latter in attendance. Exceptionally well behaved they were, too – perhaps hypnotised by the musical director’s shirt as he led the band through a varied programme, expertly compèred by trombonist Elin. 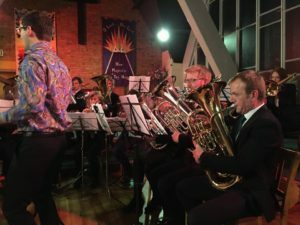 Along the way, the audience was introduced to a mysterious cornet-toting water nymph (Rusalka’s Song To The Moon), beguiled by lyrical flugelhorn and euphonium solos (Ashokan Farewell) and, finally, sent dancing away to a medley of ABBA’s hits. This thoroughly enjoyable evening also raised just shy of £400 for the Guide Dogs association.